This is Old St. Hilary's Church. 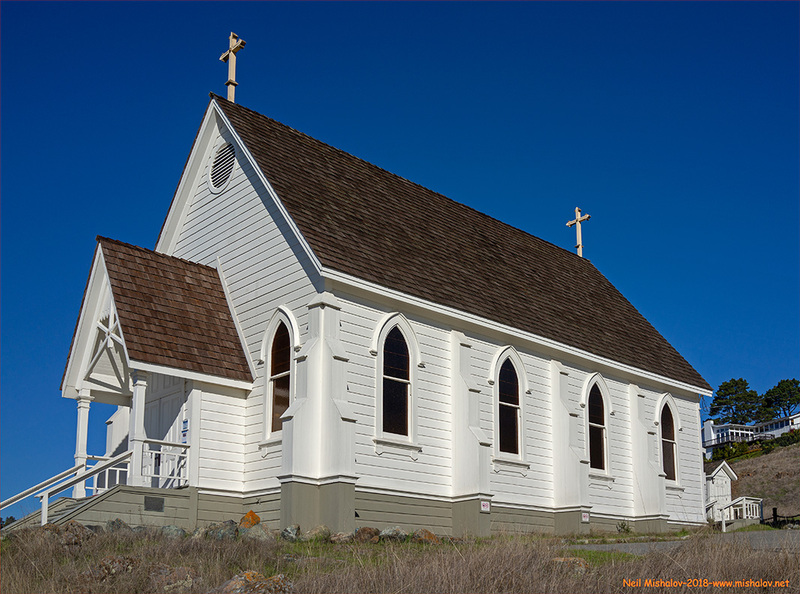 The church was built in 1888 as a place of worship for the local railroad workers, many of whom were Portuguese immigrants. It was constructed with a redwood exterior and interior, and the ceiling was made from Douglas-fir. The church is sited on a hillside with grand views overlooking San Francisco Bay, Belvedere Island, and the Golden Gate. The building is one of the few California examples of buildings created using the Carpenter Gothic style of construction to remain in its original condition and setting. 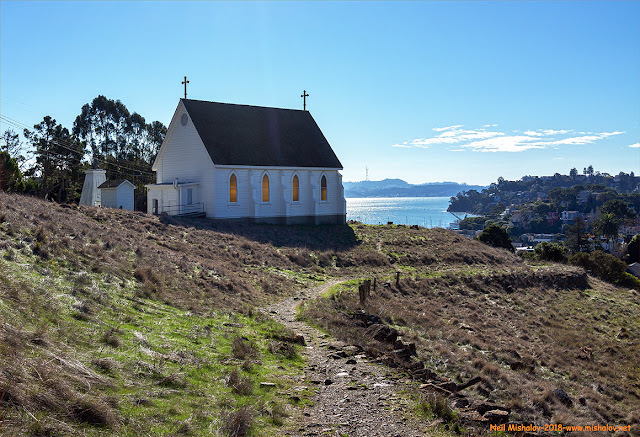 The church was eventually deconsecrated, and it was saved from demolition by the Belvedere-Tiburon Landmarks Society which purchased the building in 1959. This view is looking north. 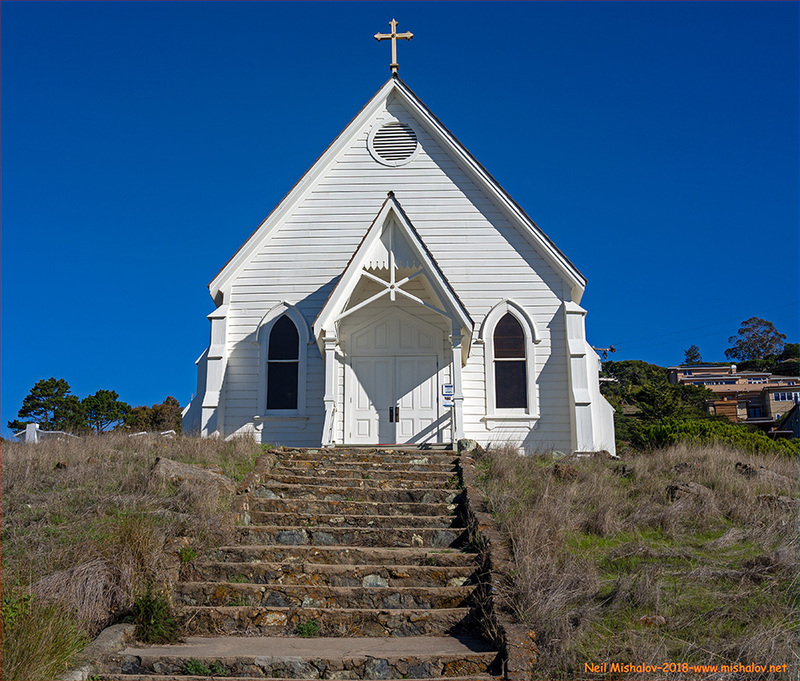 This is a scene of Old St. Hilary's Church as viewed from the Old St. Hilary's Open Space Preserve. The view is looking south. This is the entrance to Old St. Hilary's Church. 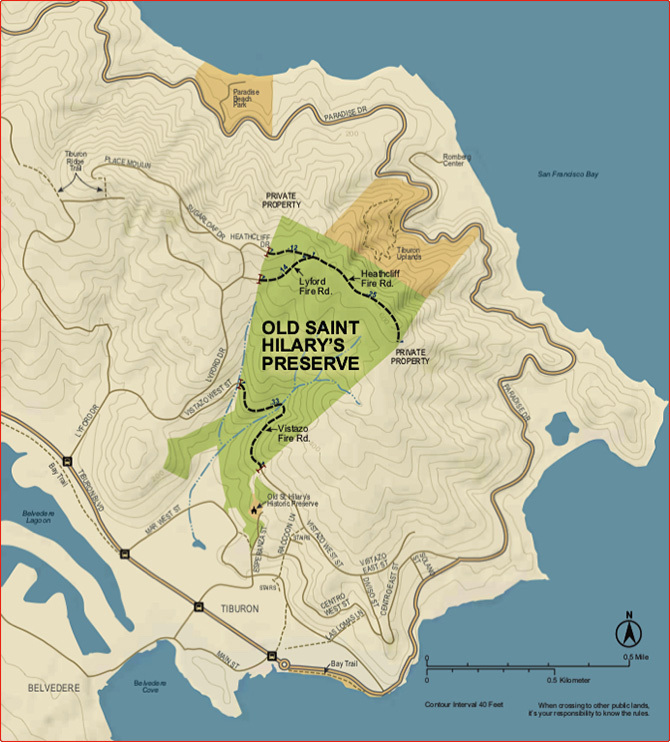 Here is a map of the southern portion of the Tiburon Peninsula. The 122 acre Old St. Hilary's Open Space Preserve is shown on the map. 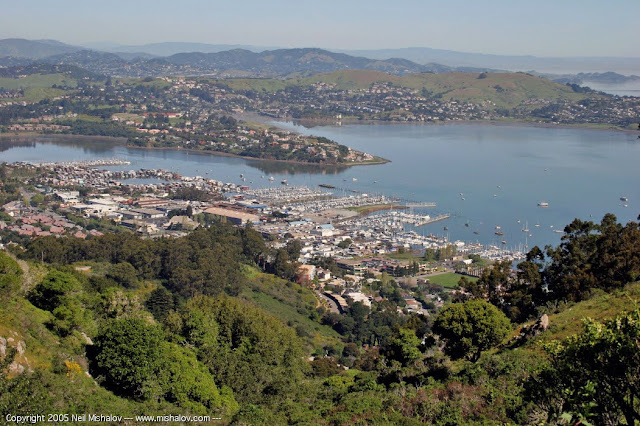 NOW This photo was taken from Belvedere Island, and it is looking east towards Tiburon. 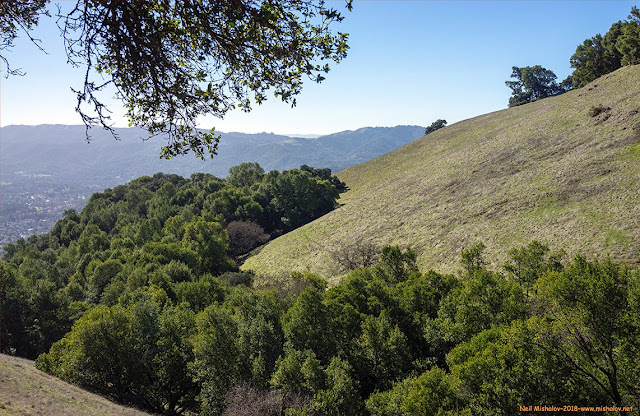 The undeveloped land seen on the hillside is the Old St. Hilary's Open Space Preserve. 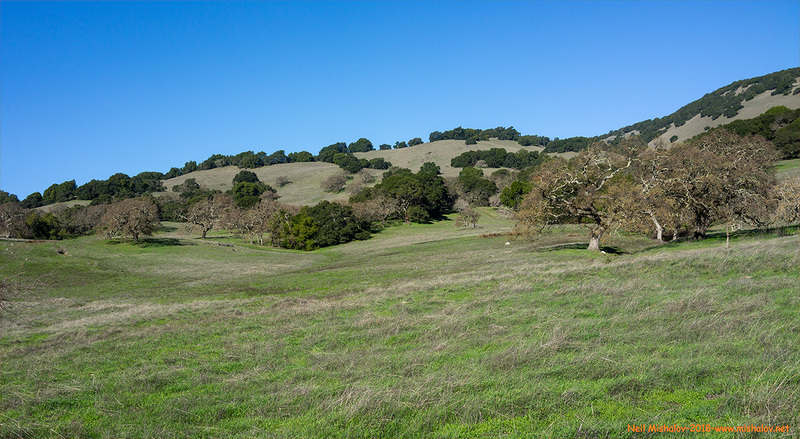 A white building is noticeable at the lower right side of the Old St. Hilary's Open Space Preserve. Yes, that is Old St. Hilary's Church. THEN Old St. Hilary's Church as seen from above Beach Road, Belvedere. The view is looking southeast. Francis Joseph Bruguiere took this picture in 1907. 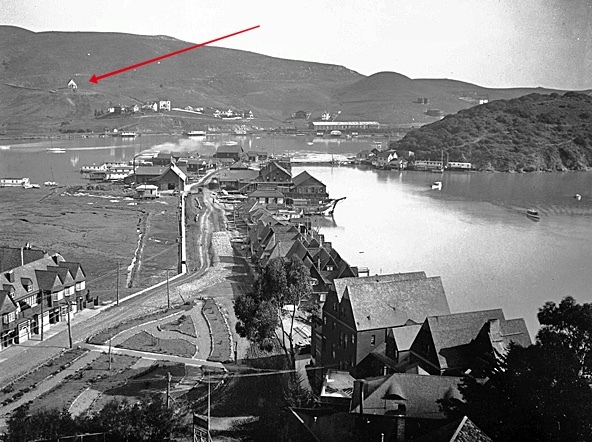 THEN Old St. Hilary's Church is visible in this photo taken in 1901. The tracks of the Northwestern Pacific Railroad can be seen. 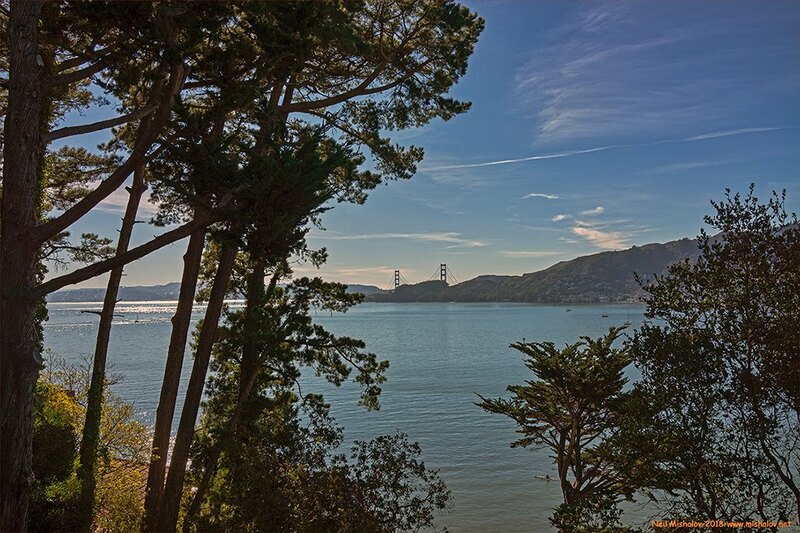 Here is a photograph of Angel Island as seen from the Old St. Hilary's Open Space Preserve. Visible ahead is Hospital Cove. There is a pier sited within the cove and ferry services to Angel Island are available from San Francisco, Sausalito, and Tiburon. The picture is looking south, and San Francisco is visible across San Francisco Bay. This photo from the Old St. Hilary's Open Space Preserve is looking east across San Franciso Bay. 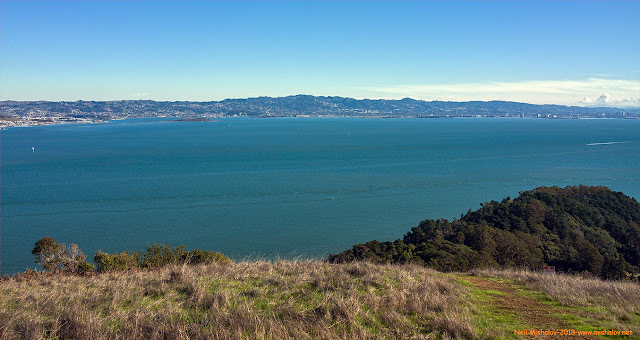 The cities of Richmond, El Cerrito, Kensington, Albany, Berkeley, Emeryville, and the northern part of Oakland are discernable within this photograph. This photo was taken from the Old St. Hilary's Open Space Preserve. This view is looking northwest, and beautiful Mount Tamalpais overlooks the scene. Here is a photograph of the Richmond-San Rafael Bridge as seen from the Old St. Hilary's Open Space Preserve. The picture is looking north. This is a view of the northern boundary of the Old St. Hilary's Open Space Preserve. Housing occupies the hillside. 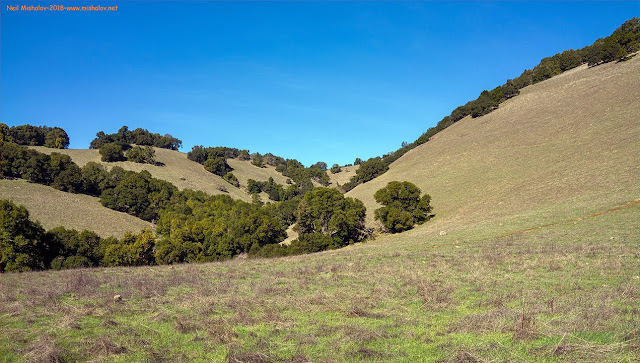 Here is another view of the northern boundary of the Old St. Hilary's Open Space Preserve. 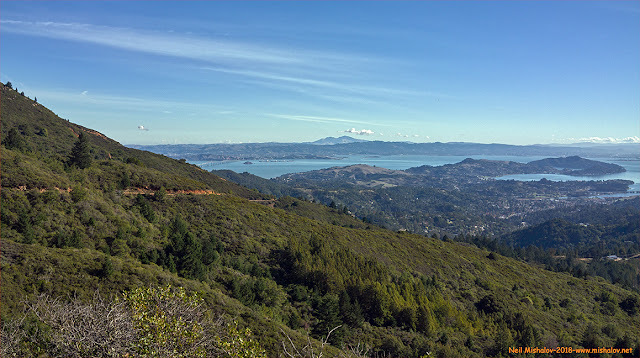 This view is looking west, and it shows Belvedere, the Golden Gate Bridge, and the Marin Headlands. 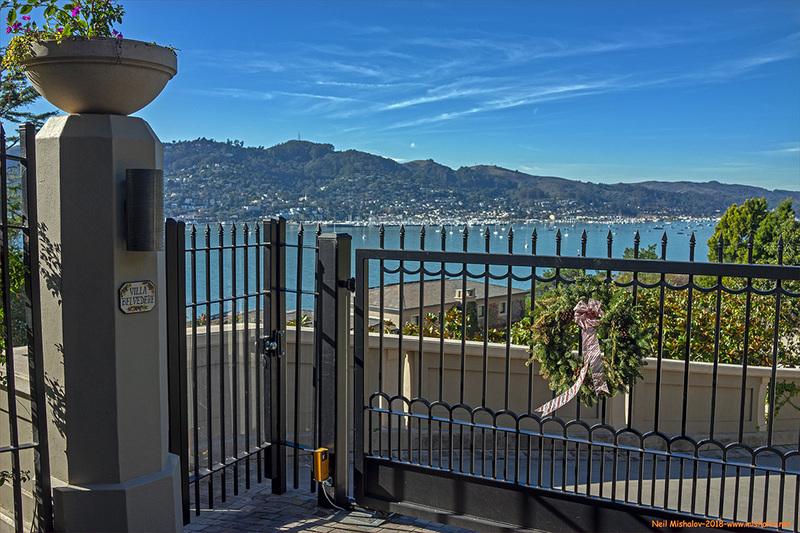 Belvedere is located 1.5 miles across Richardson Bay from Sausalito. Belvedere is an island located adjacent to the Tiburon Peninsula and is accessible via a short roadway from the city of Tiburon. This picture was taken from Old St. Hilary's Open Space Preserve. This bucolic scene across Richardson Bay was the site of the World War II Marinship shipbuilding facility. Marinship built a combined total of 93 cargo ships and oil tankers between 1942 and 1945. Two-thousand workers worked 8-hour shifts, 24 hours a day, 365 days a year until the Japanese signed an unconditional surrender on 2 September 1945. This picture was taken from the west side of Belvedere Island. 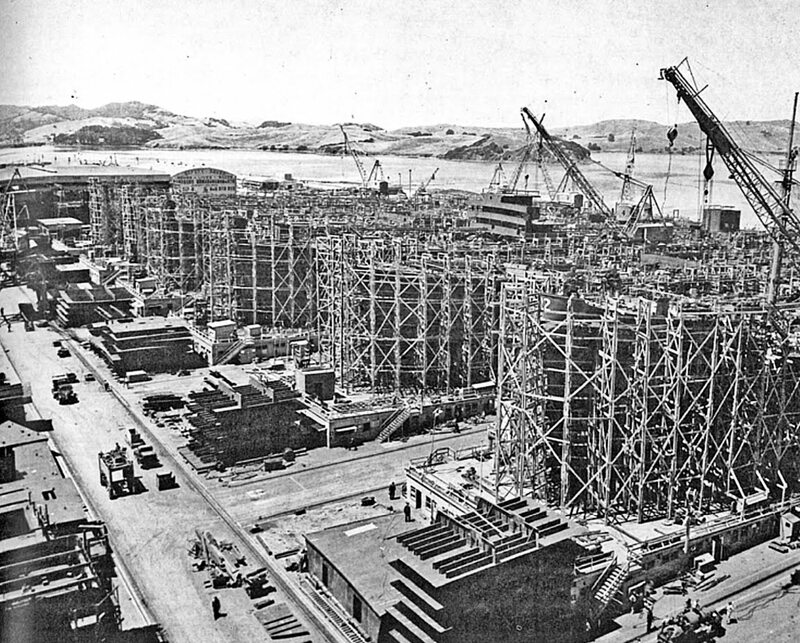 THEN There are six ships under construction in this picture of the Marinship shipyard. Harbor Point is visible in the background. This picture is looking north and it is circa 1944. THEN There are eight ships under construction in this picture of the Marinship shipyard. Ahead is Belvedere Island; behind Belvedere Island is the Tiburon Peninsula. This picture is looking east and it is circa 1944. NOW This is an overview of the Marinship shipyard location. 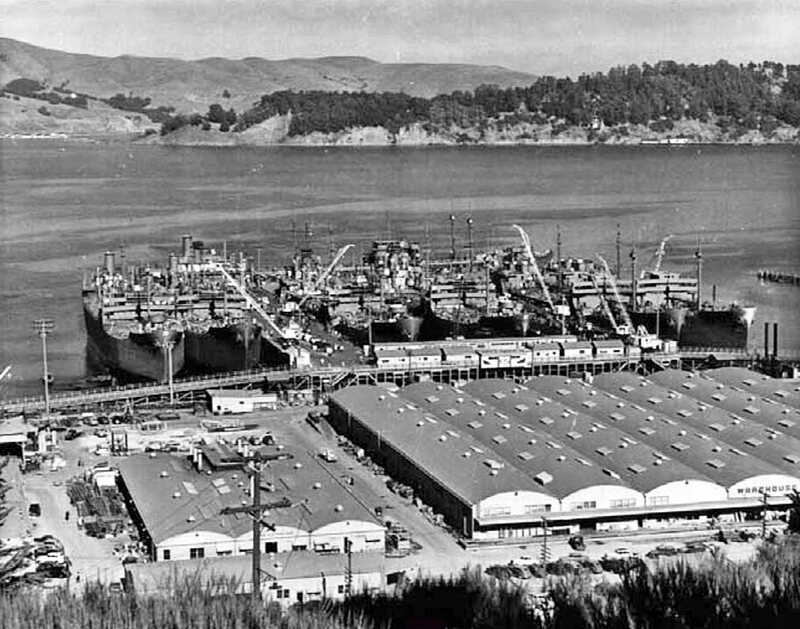 This picture of the Marinship site was taken from the Marin Headlands, and the view is looking north. This photograph was taken on 31 March 2005. This photograph was taken from the west side of Belvedere. The view is looking south. 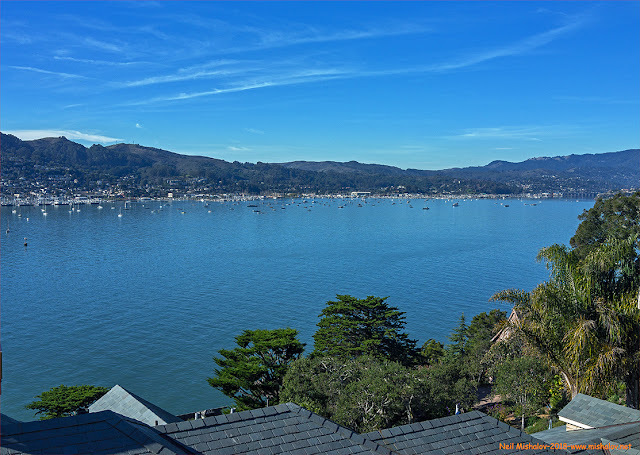 This is a view from Belvedere looking west across Richardson Bay. 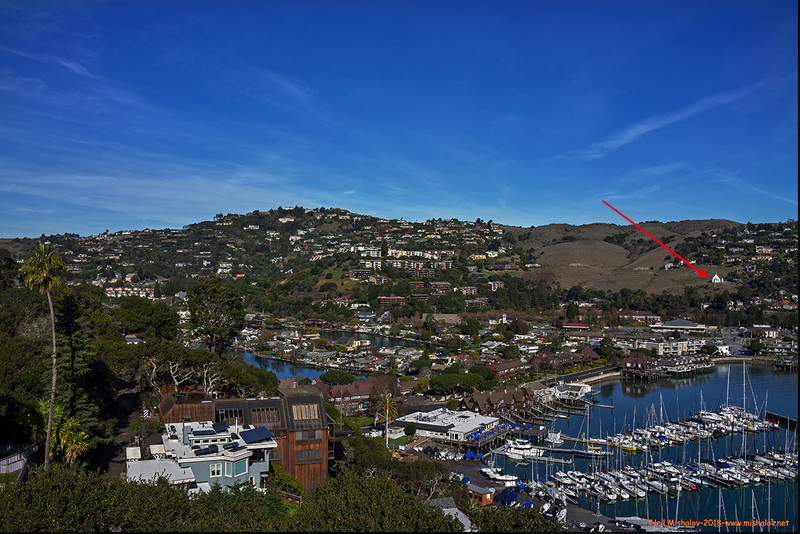 Sausalito is ahead. This is the main entryway to Villa Belvedere. 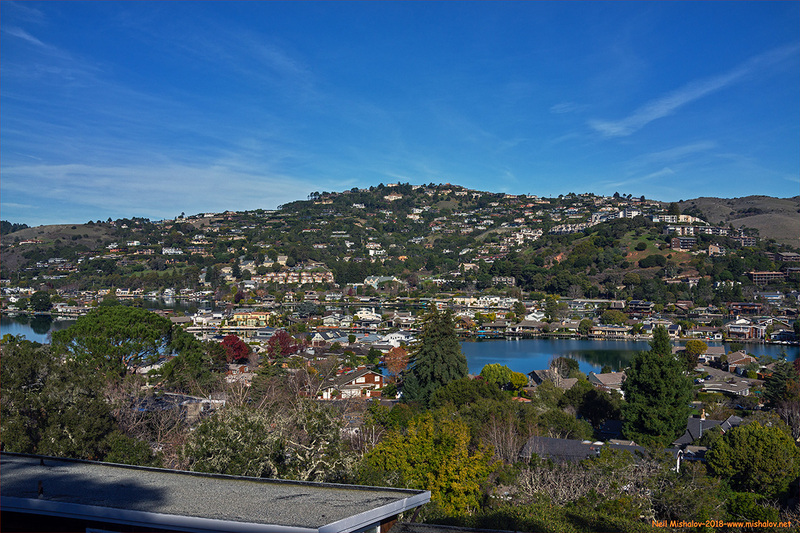 The view is looking west, across Richardson Bay. 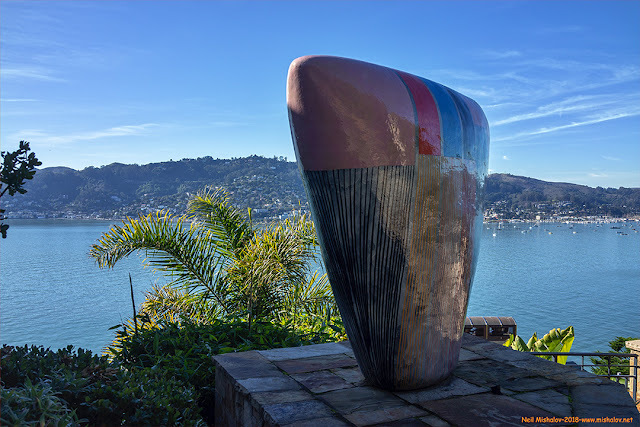 This lovely artwork is at the entryway to a home located on the west side of Belvedere. 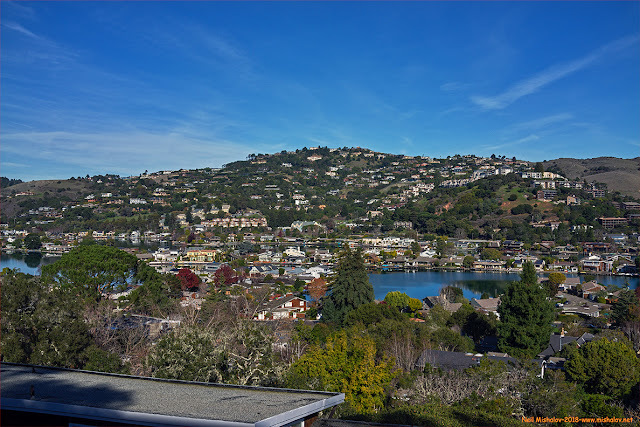 This is a photo of the southern portion of the Tiburon Peninsula, it was taken from the east side of Belvedere. 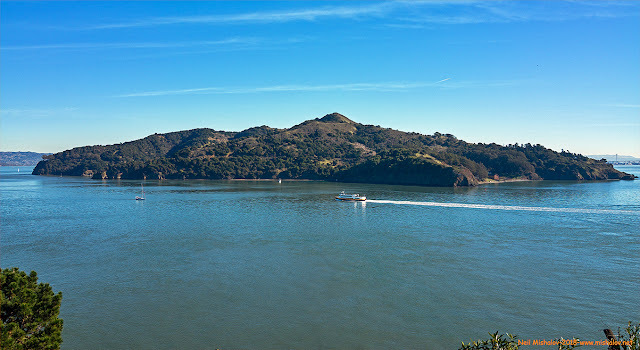 This photograph of Angel Island was taken from the southern side of Belvedere. A Golden Gate Ferry is motoring from Sausalito to the Hospital Cove dock at Angel Island. 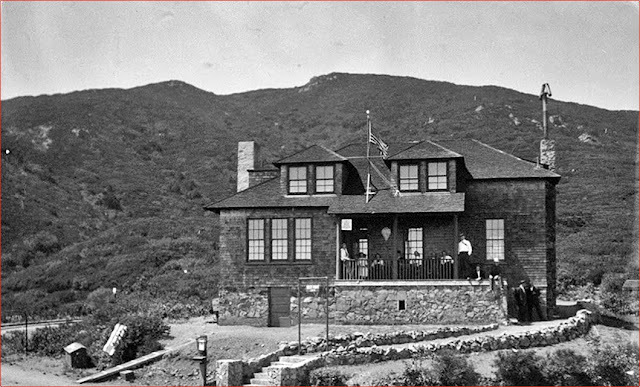 Angel Island was the site of US military posts for almost 100 years. A partial view of the first US Army camp constructed on Angel Island is visible in this picture. A cove is noticeable to the right of the ferry, with a brick warehouse building detectable at the shoreline. This was the location of Camp Reynolds; the camp was built during the American Civil War. 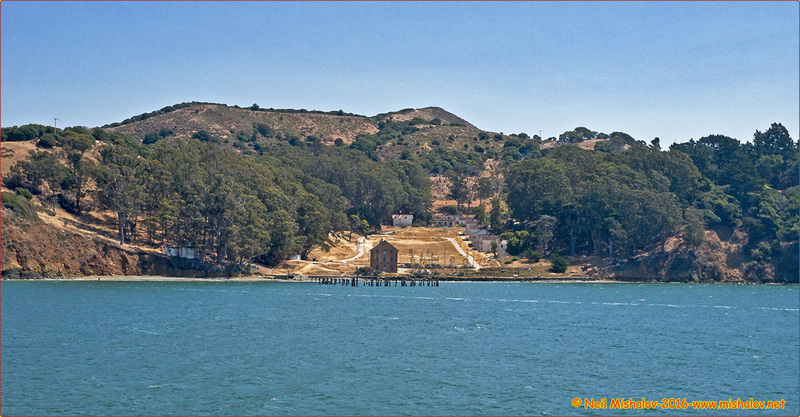 NOW This photo of Camp Reynolds was taken from a ferry traveling from San Francisco to Sausalito on 13 August 2016. THEN This photo of Camp Reynolds was taken in 1890. Some of these buildings are still standing. This view is looking southeast. The brick warehouse is not visible in this photograph, it is just out of view on the right side of the photo. This is a view of the summit of Mount Burdell, 1,558 feet (475 meters), as seen from a street in the City of Novato. The picture is looking north. This ramble started at San Marin High School, and we immediately started climbing up the Bay Area Ridge Trail. 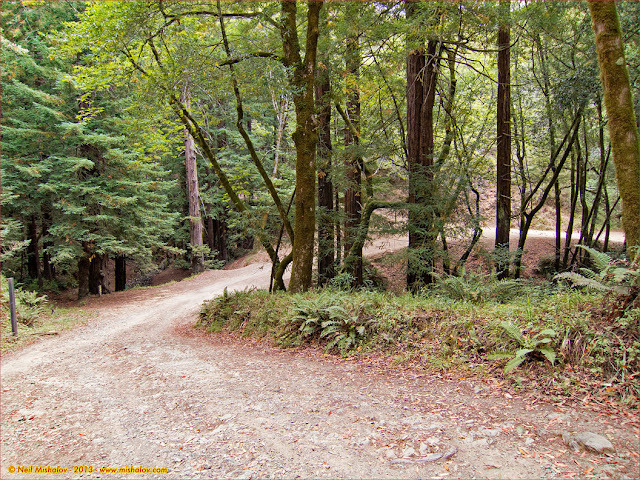 We continued onto the Dwarf Oak Trail, and then went up the Deer Camp Fire Road and the Cobblestone Fire Road. After which, the summit beckoned, and we summited Mount Burdell. 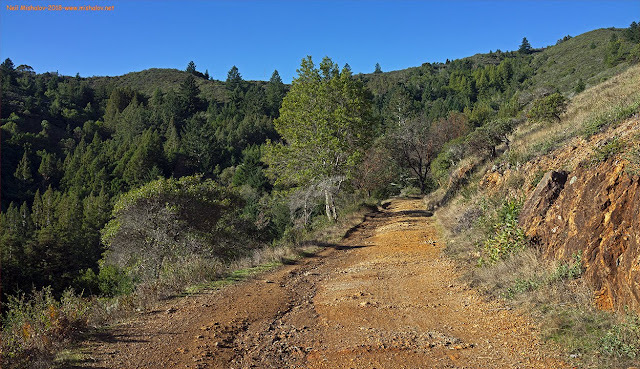 Our descent from the summit of Mount Burdell back to Novato was more direct: we went down the Old Quarry Trail, the San Carlos Fire Road, and the San Marin Fire Road. It was then onto San Marin Drive and the return to San Marin High School. The round trip distance as recorded by a Garmin GPS was approximately 7.8 miles and the cumulative elevation gain was about 1,574 feet. 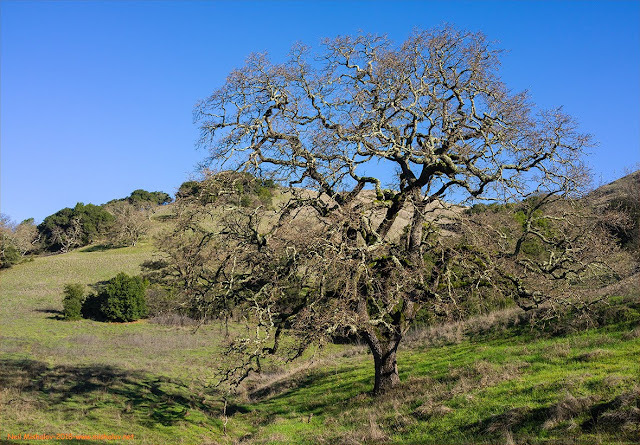 Here is a delightful oak tree as seen from the Dwarf Oak Trail. 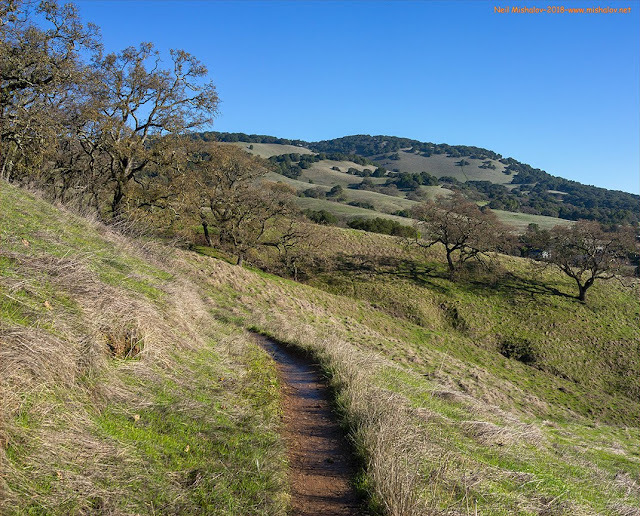 The picture was taken from the Dwarf Oak Trail. Yes, this is the Cobblestone Fire Road; we are near the summit. Here is a view from the Old Quarry Trail. 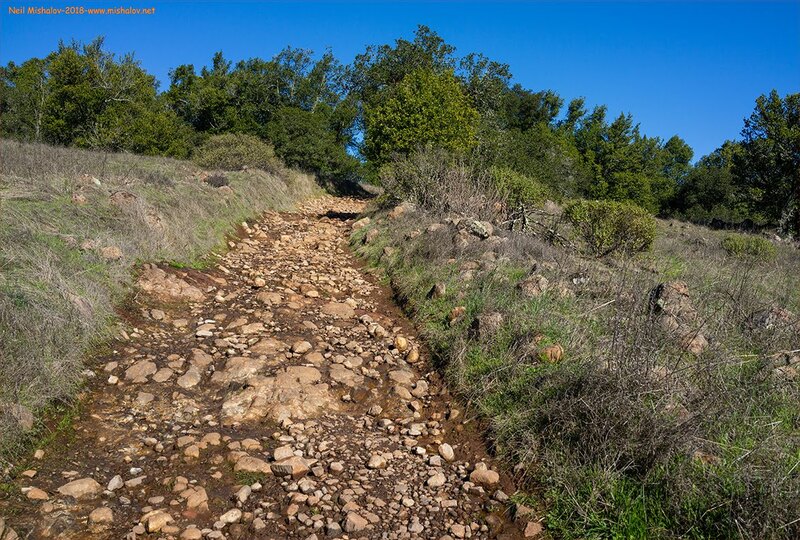 We are cranking up the Dwarf Oak Trail. This is a view from the Old Quarry Trail. This picture was taken from the Deer Camp Fire Road. 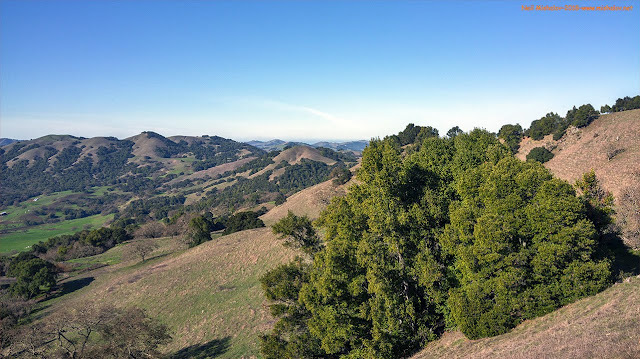 Here is a scene from the summit of Mount Burdell. Chinese laborers constructed a rock wall at the summit in the 1870s, the remnants of which can be seen. The Pacific Ocean is visible on the horizon, and the picture is looking southwest. This picture was taken from the summit of Mount Burdell. The view is looking west. 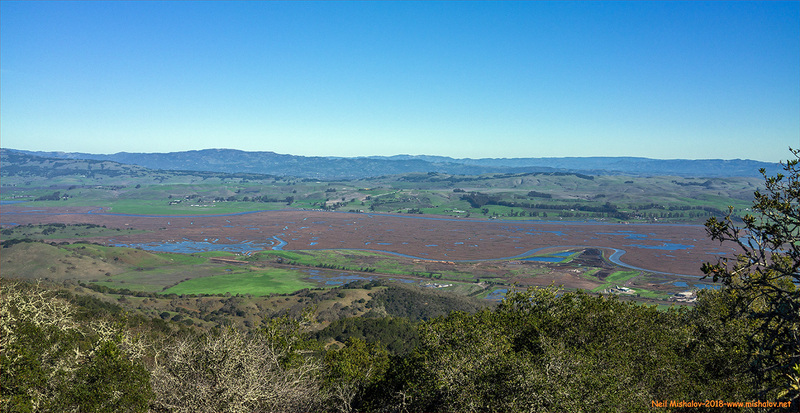 This is a view of the Petaluma River Marsh Wildlife Area as seen from the summit of Mount Burdell. The picture is looking east. Traveling south on the Old Quarry Trail, and heading back to the City of Novato. THEN This is Mount Tamalpais and Muir Woods Railway locomotive car #5. It is a Shay locomotive constructed by the Lima Locomotive Works in 1906. The locomotive was shipped to Mindanao Island in the Philippines in 1937. This picture was taken when the locomotive was receiving a supply of water from the Fern Creek Canyon water tank stop located on Mount Tamalpais. This photo is circa 1920. NOW This was the location of the Fern Creek Canyon water tank stop. This photo was taken on 28 July 2013. 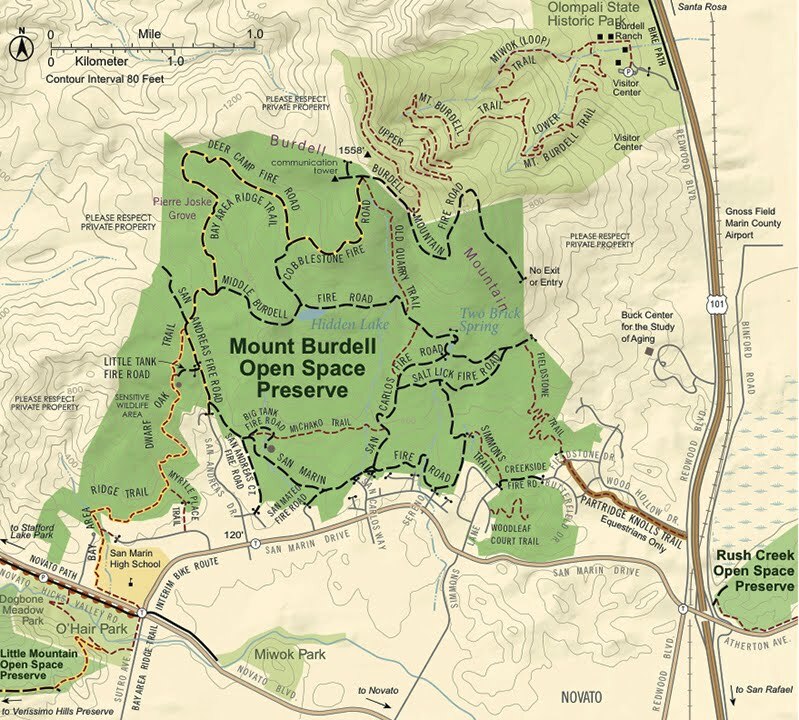 This 12-mile hike, as depicted in the below map, was tracked with a Garmin GPS. The Mill Valley and Mount Tamalpais Scenic Railway was a tourist railroad located in Marin County, across San Francisco Bay from San Francisco. Steam trains ran between the city of Mill Valley and the east peak of Mount Tamalpais. The first passenger train started operating on 22 August 1896. The train line had 281 curves, and its promoters called the train line "the crookedest railroad in the world." 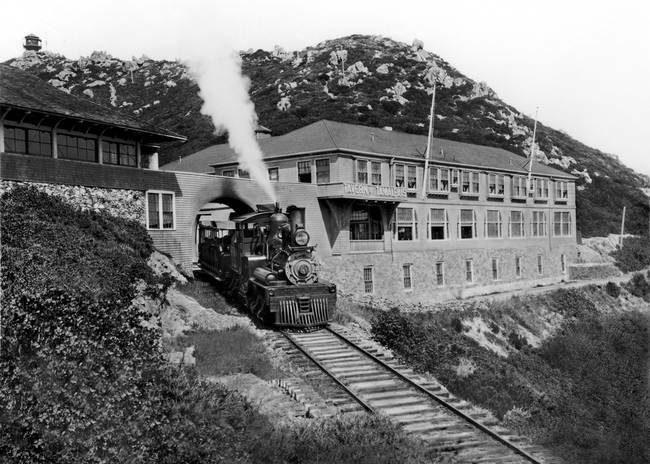 The railroad company built a hotel near the summit and an inn at the westernmost point of the railroad route. The railroad line ceased operation in 1930. Construction of the train line began on 5 February 1896. Over 200 men graded the route and laid the rails. Within six months, the railroad construction was completed at the cost of $55,000. The price of the railroad equipment was an additional $80,000. 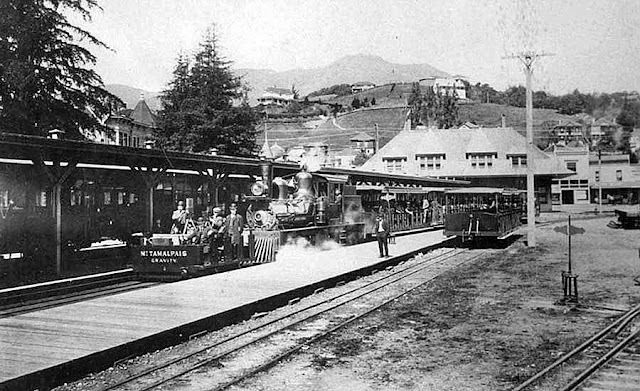 Louis L. Janes was the driving force behind the creation of a railroad at Mount Tamalpais. 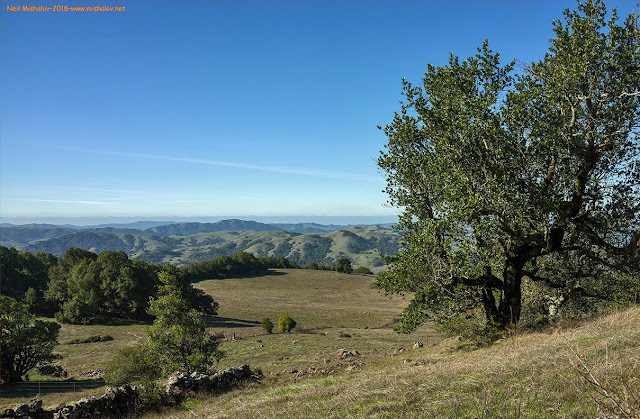 Mr. Janes was the director of the Tamalpais Land & Water Company. Sidney B. Cushing, president of the San Rafael Gas & Electric Company, was named the president of the railroad. 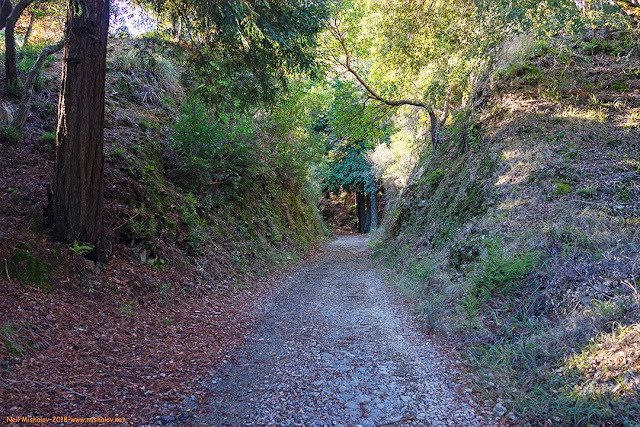 Albert E. Kent gave the railroad the right-of-way through his property in Corte Madera Canyon in exchange for $10,000 in stock in the corporation. 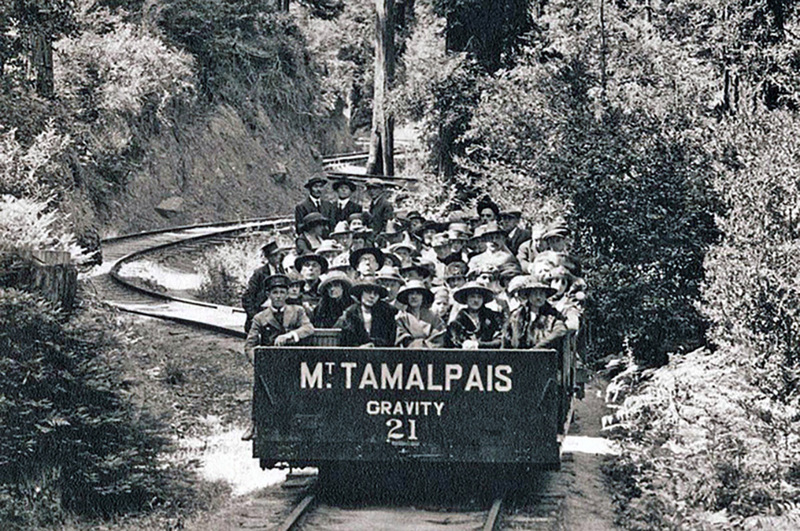 The Mill Valley and Mount Tamalpais Scenic Railway introduced gravity cars in 1907. 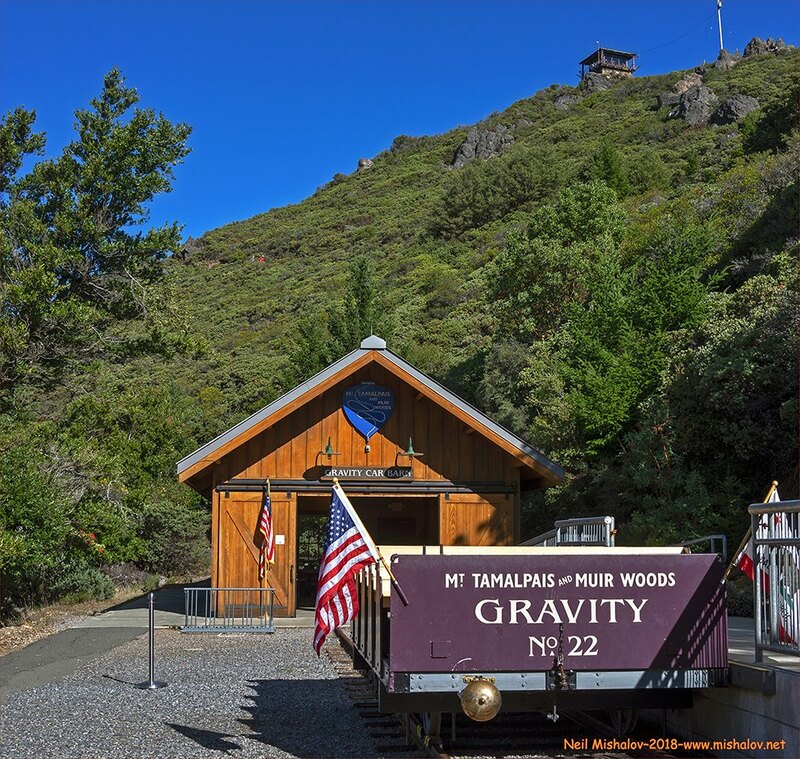 The gravity cars traveled from the east peak of Mount Tamalpais down to either Muir Woods or Mill Valley. When the gravity car route to Muir Woods became active, the name of the train line was changed to the Mount Tamalpais & Muir Woods Railway. Each gravity car had an operator, known as a gravityman, who sat in the front right seat of the car and controlled the car's braking system to ensure that the car did not exceed a maximum speed of 12 miles-per-hour. The gravity cars glided down Mount Tamalpais and were then towed back up to either the east peak summit or Mesa Station by a steam locomotive, where the gravity cars were made ready for their next run down the mountain. The rail configuration did not provide the steam trains with the ability to accomplish a 360° turn on the route. 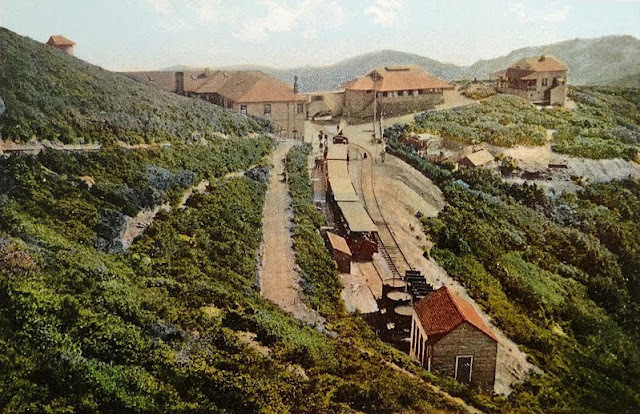 The locomotive engines instead pushed the passenger cars up the mountain and then pulled the passenger cars down the mountainside. This method of travel provided better viewing opportunities for the passengers as they ascended the mountain. It also ensured that smoke and particles from the locomotive smokestack did not disturb the passengers during their ascent to the summit. And most important, the configuration of pushing passenger coaches up the mountainside prevented coach breakaways. In 1915 the railroad carried an average of 700 passengers per day during the summer. There were no passenger lives lost during the railroad's operation. Two men employed by the railroad did, however, lose their lives. One was scalded to death when a locomotive of which he was the operator, overturned on a descent of the mountain. Another man was killed during a collision of two trains in the Mill Valley train depot. In 1913 a fire raged on Mount Tamalpais for five days. Soldiers from the Presidio of San Francisco were called out on the first day of the fire. Before the fire was contained more than 7000 firefighters were engaged in the fight. 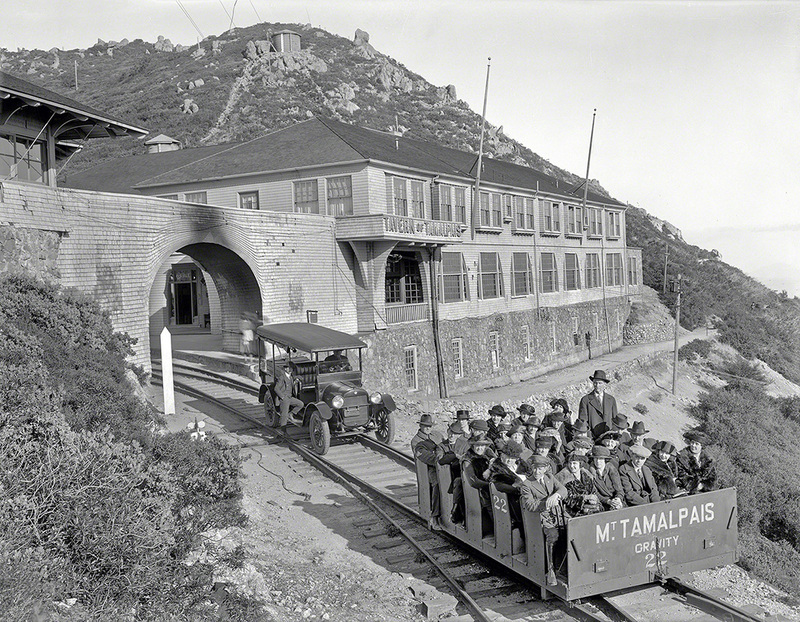 The "Tavern of Tamalpais," was a restaurant and hotel built by the railroad at the railway terminal at the top of Mount Tamalpais. The building burned down in 1923. It was quickly rebuilt, in a less elegant style, and a smaller size. It was also configured to service both train and automotive visitors. As automobiles became more popular and affordable, the number of railroad passengers who traveled to the top of Mount Tamalpais decreased, while the number of cars driven to the east peak of Mount Tamalpais increased. A significant fire began on Mount Tamalpais on 2 July 1929. That fire proved to be the deciding factor for the permanent closure of the railroad in 1930. The primary reason for shutting down of the railroad was, however, not the fire; instead, it was the proliferation of the automobile. The era of railroad transportation was giving way to the new age of gasoline-powered cars. The train tracks were pulled up and sold. Most of the locomotive engines were sold to tree logging companies located in northern California and the states of Oregon and Washington. Two locomotives were sent to the Republic of the Phillippines. 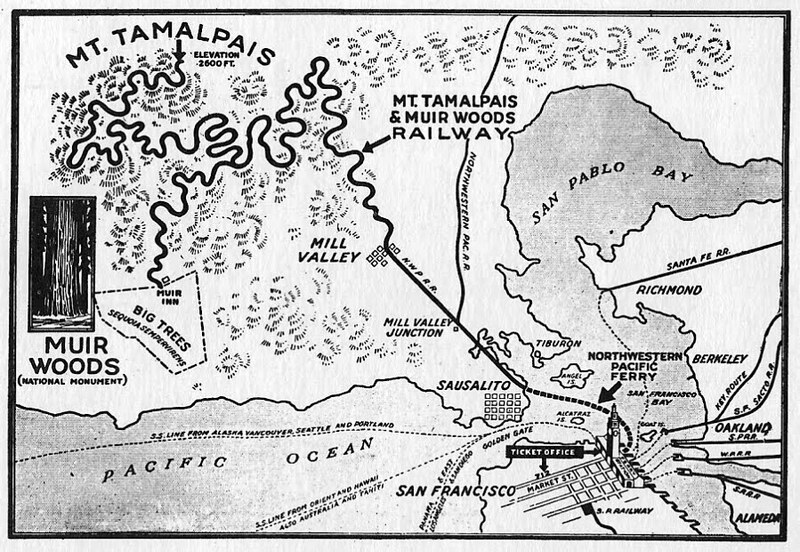 This map was a part of an advertising brochure produced by the Mount Tamalpais and Muir Woods Railway. The map shows the routes of the steam trains and the gravity cars. It also shows the five ferry lines that traveled from the East Bay to the San Francisco Ferry Building. This map also includes the route of the Northwestern Pacific Ferry that motored from the Ferry Building, across San Francisco Bay, to Sausalito. 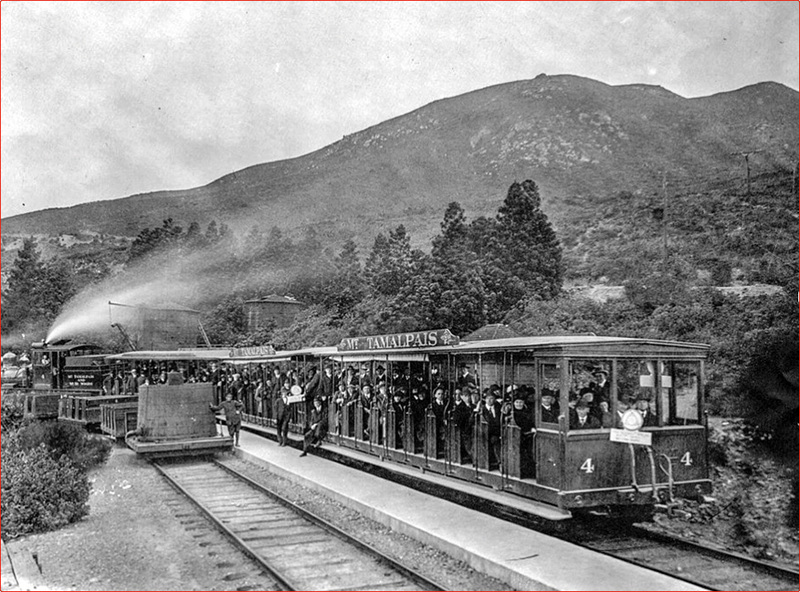 Passengers then took a short train ride from Sausalito to Mill Valley, the start of the 2,300-foot railroad ascent up Mount Tamalpais. 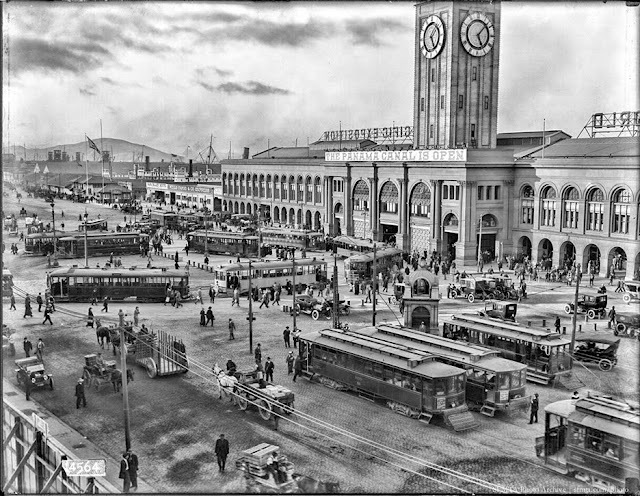 THEN The San Francisco Ferry Building was a bustling location in the early 20th Century. 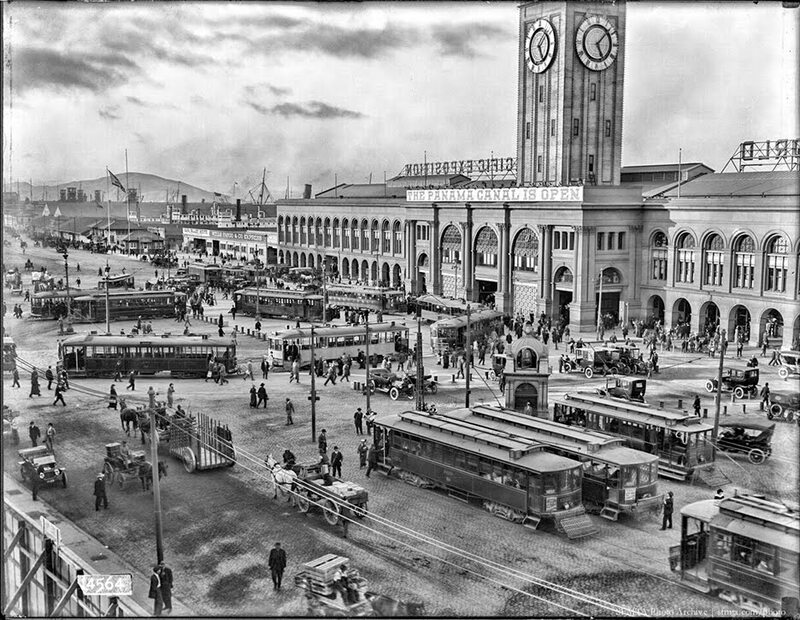 Approximately fifty-five million people passed through the ferry building each year during the 1920s and 1930s. This picture was taken in 1916 during the tenth anniversary of the 1906 earthquake. 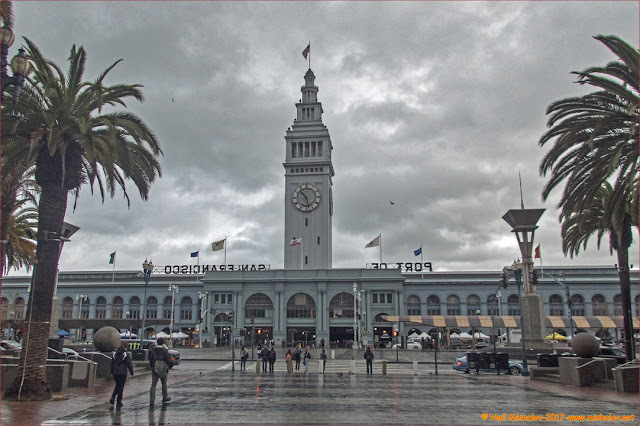 Before the completion of the San Francisco-Oakland Bay Bridge in 1936 and the Golden Gate Bridge in 1937, the Ferry Building was the second busiest transit terminal in the world, second only to London's Charing Cross Station. This view is looking northwest. NOW This picture of the Ferry Building was taken on 7 January 2017. The view is looking north. 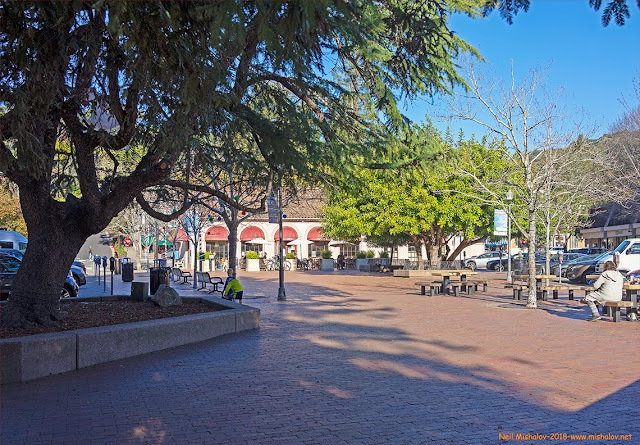 THEN This is a view of the combined North Pacific Coast Railroad depot, and the Mount Tamalpais & Muir Woods Railway depot, located in downtown Mill Valley. This photo is circa the 1920s, and the view is looking north. 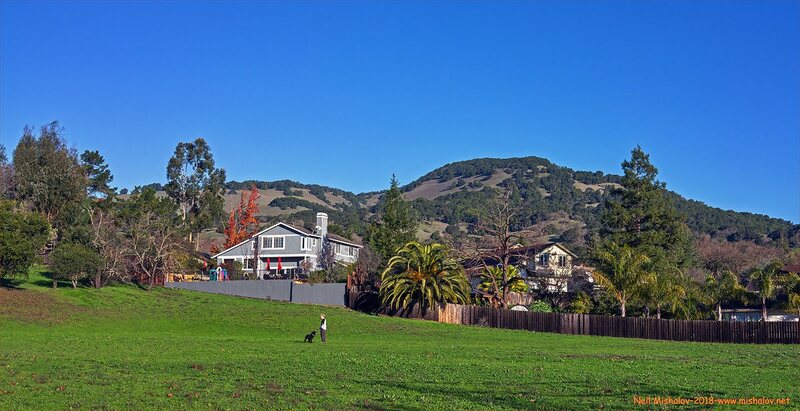 Mount Tamalpais beckons in the distance. NOW The railroad depot is history, and the site is currently being used as a pedestrian recreation area, and for car parking. THEN This is another view of the railroad depot in downtown Mill Valley. This photo is circa the 1920s. NOW No trains, no tracks. It is now an area for people to sit and talk. THEN This was the original Mill Valley Railroad Depot. 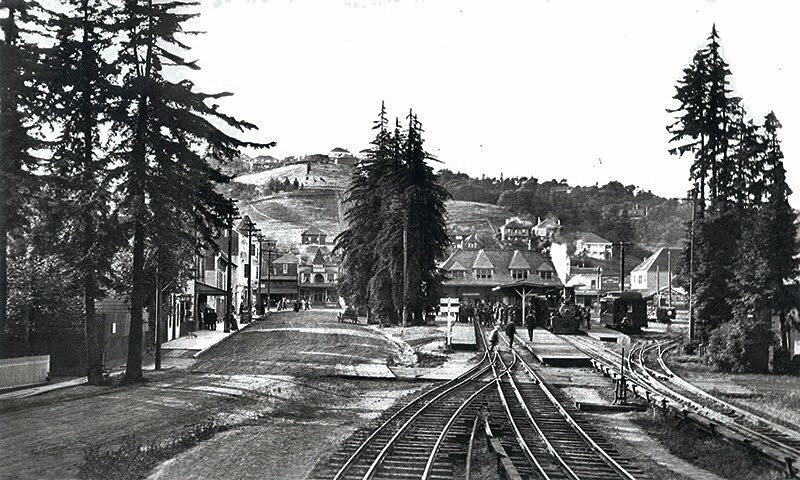 The trains in this picture traveled to Mill Valley from Sausalito. 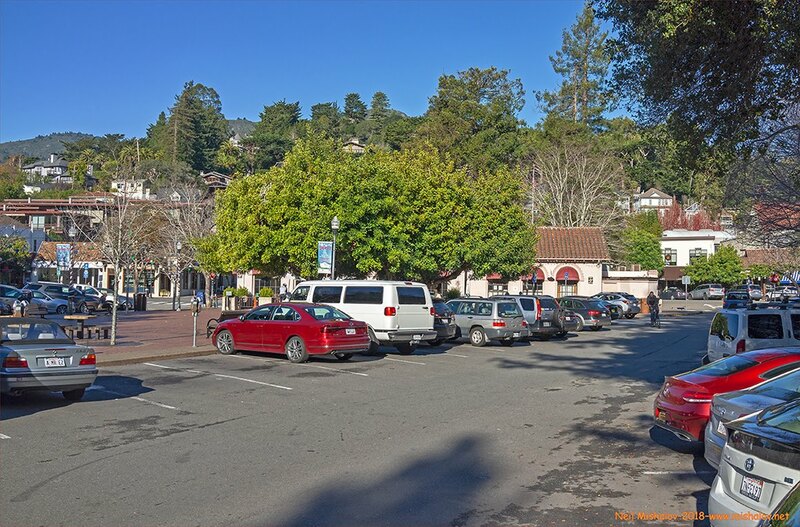 People who visited Mill Valley from the majority of locations in the San Francisco Bay Area did so by first taking either a ferry, a train, a San Francisco streetcar, a San Francisco cable car, or a horse & carriage to San Francisco's Ferry Building. They then took a ferry from the Ferry Building to Sausalito. 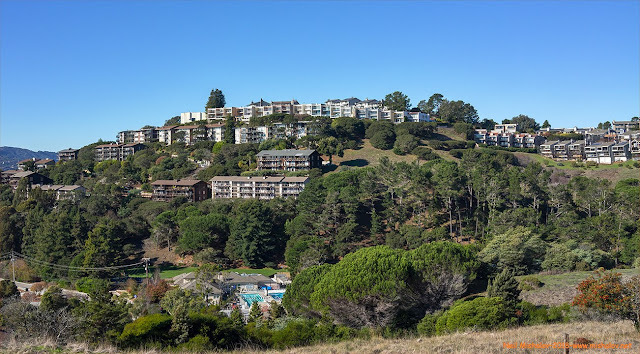 It was a short train ride from Sausalito to Mill Valley. 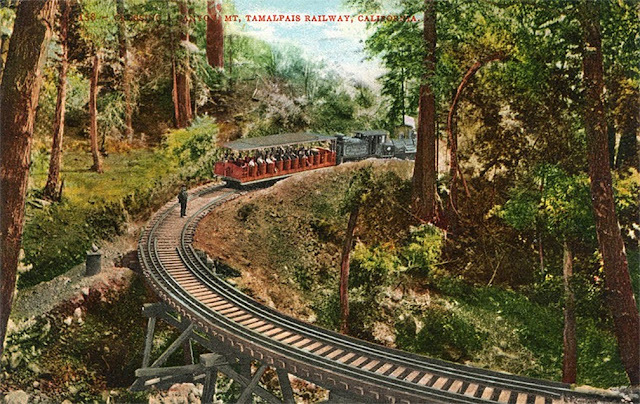 There were no bridges traversing San Francisco Bay when the Mill Valley and Mount Tamalpais Scenic Railway was in operation. This photo is circa 1910. 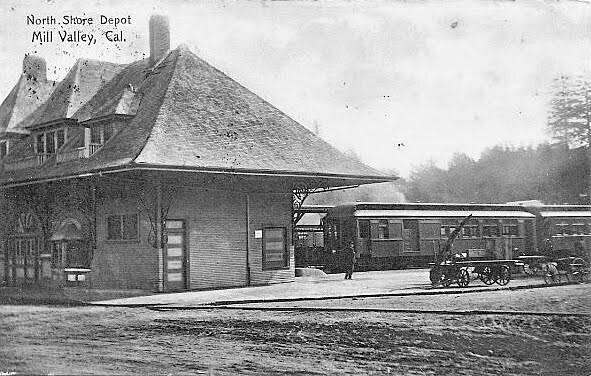 NOW The current version of the Mill Valley Railroad Depot was constructed by the Northwestern Pacific Railroad in 1929. This building replaced the earlier station which can be seen in the above photos. This railway depot served as the terminal for the Northwestern Pacific Railroad, and it was also utilized by the Mount Tamalpais & Muir Woods Scenic Railway until it ceased operation in 1930. The last Northwestern Pacific electric commuter train departed for Sausalito on 30 September 1940. 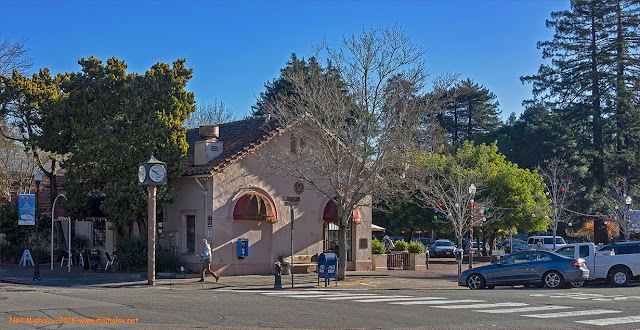 This former railroad depot building is now owned by the City of Mill Valley and is being used as a quiet bookstore and coffee shop. This is a sight of the railroad grade in Blithedale Canyon. The view is looking north. THEN This is a picture postcard view of Horseshoe Curve which is located in Blithedale Canyon near Mill Valley. The train line ceased operation in 1930, and the tracks were then removed. Government authorities required that the twenty-two train trestles on the train line be taken down for safety reasons. Water pipes were installed on the ground to allow continued water flow down the creek beds, and fill dirt covered the creek openings. 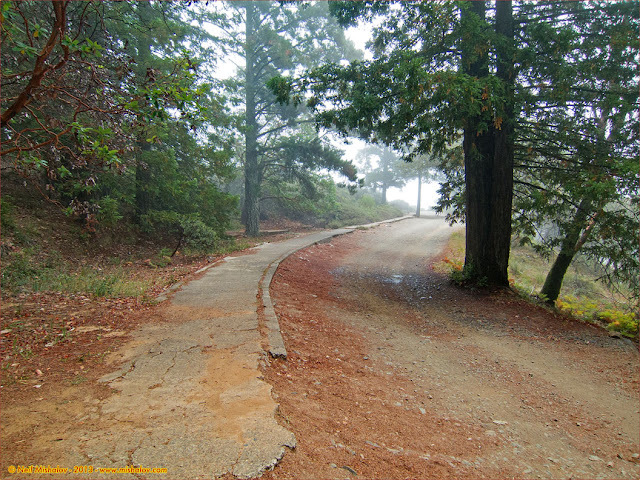 A fire road, bicycle route, and pedestrian walkway became the main use of the former railroad right of way. This trestle was positioned over the Arroyo Corte Madera del Presidio Creek. NOW This is a recent view of Horseshoe Curve. The photo was taken on 28 July 2013. Lima Locomotive Works was located in Lima, Ohio. It constructed Mount Tamalpais and Muir Woods locomotive car No. 8 in 1912. This car weighed 74,000 pounds. Locomotive car No. 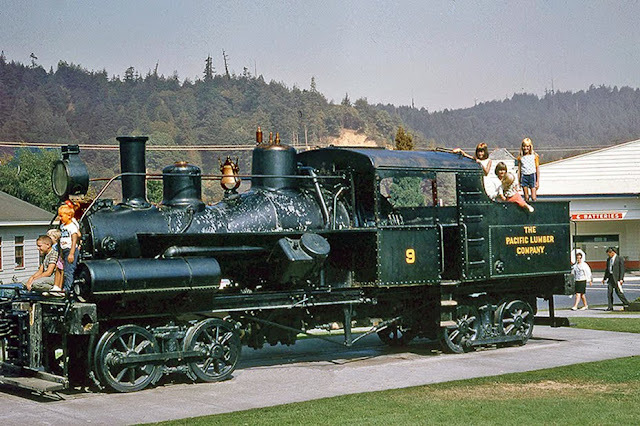 8 was sold to the Shell Oil Company in Martinez California in 1931 after the Mount Tamalpais and Muir Woods Railway ceased operation. Shell Oil then sold the locomotive to Six Companies of Boulder City, Nevada. 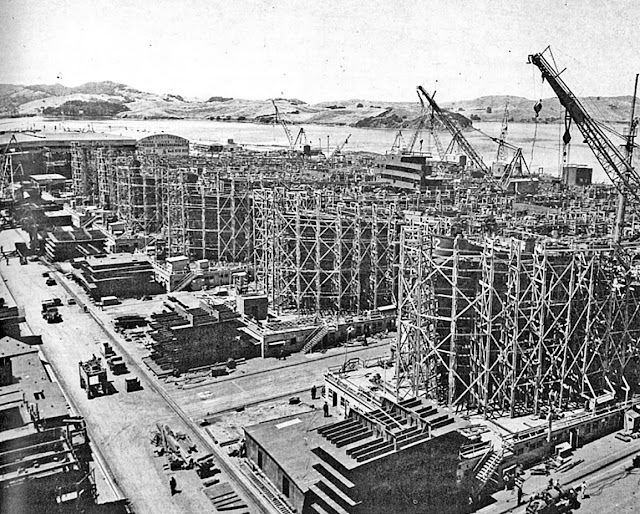 Six Companies was a joint venture of six construction companies formed to construct the Hoover Dam. Locomotive car No. 8 was wrecked in 1932 during the construction of the dam. Car No. 8 was subsequently sold for scrap. This photo is circa the 1920s. This is a view of a lower segment of the railway grade. The picture is looking northwest. This is the McKinley Cut. United States President William McKinley was in San Francisco for official meetings during early May 1901. The President and his wife Ida McKinley were scheduled to ride on the Mill Valley and Mount Tamalpais Railway up to the summit of Mount Tamalpais on 8 May 1901. In commemoration of the President and his wife's upcoming visit, the railroad named a previously unnamed railroad cut in the President's honor. 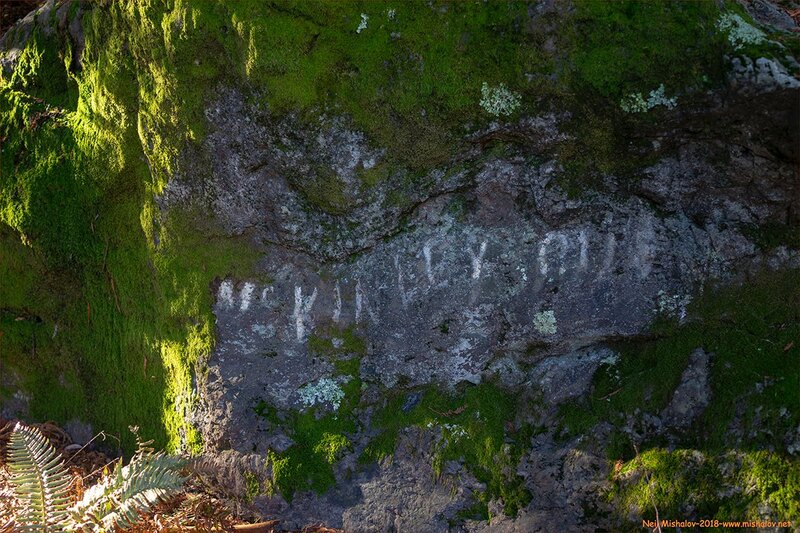 Railroad authorities sent a crew up to the site before the scheduled tour, and they painted "McKinley Cut" on a large rock at the entrance to the railroad cut. The President's wife became ill on 7 May, and their trip from San Francisco to Mount Tamalpais was canceled. Within four months President McKinley was assassinated in Chicago, Illinois, the victim of an anarchist. This is the original painted "McKinley Cut" signage. It is now 117 years old. This is a vista of the railroad grade. The view is looking east. Here is another scene of the railroad grade looking east. 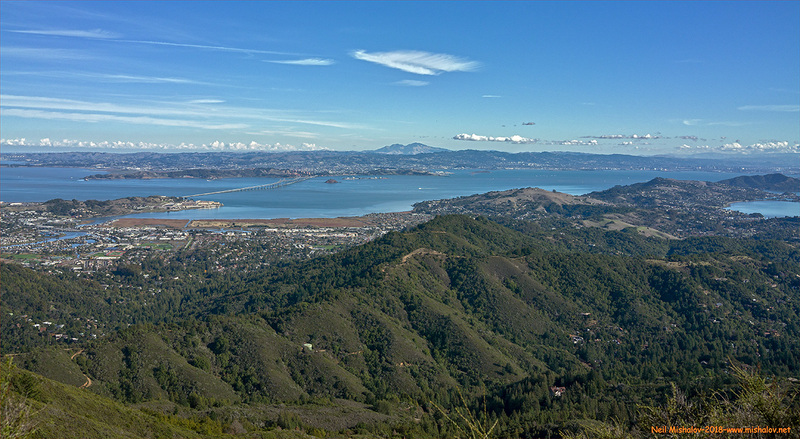 The Berkeley Hills are visible across San Francisco Bay, and Mount Diablo is evident in the background. 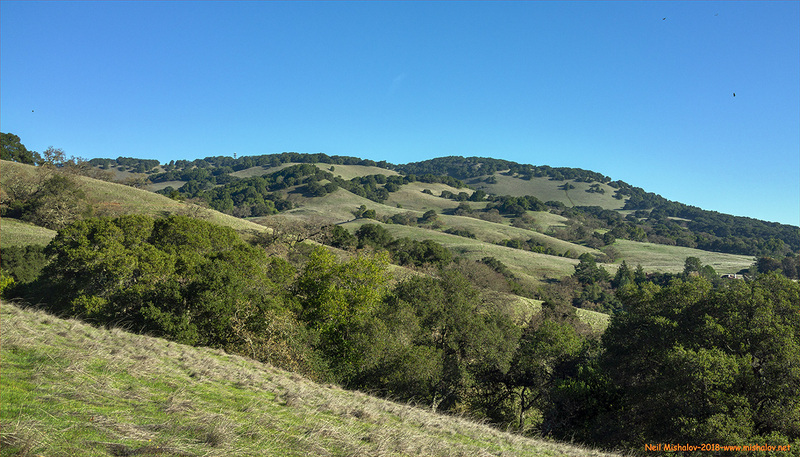 This is a view from the railroad grade looking northeast. Ahead is the east peak summit. The fire lookout station sited at the top of the peak is barely visible. THEN This is a view of Mesa Station, which was contiguous with the lower section of the Double Bow Knot. 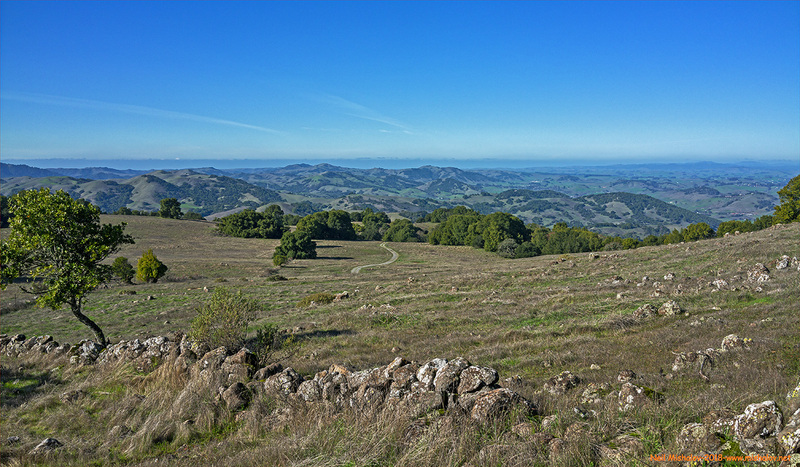 The east peak of Mount Tamalpais is visible in the background. Mesa Station was a site where the locomotive engineer could replenish the engine's water supply, when necessary. 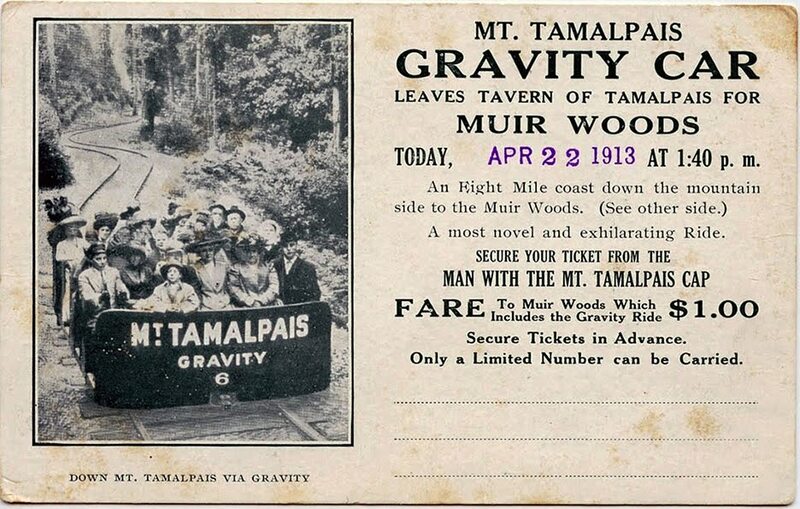 It was also the location where passengers could switch from a steam train to a gravity car for a descent to Muir Woods. Visible in this picture are two water storage tanks located in front of the stand of trees in the background. This photo is circa the 1920s, and the view is looking west. Mesa Station was located on the lowermost portion of the Double Bow Knot. The Double Bow Knot was where the train tracks wound back and forth paralleling themselves five times to climb 168 feet in an area 600 feet wide. This photo of the Double Bow Knot was taken on 27 June 2004. 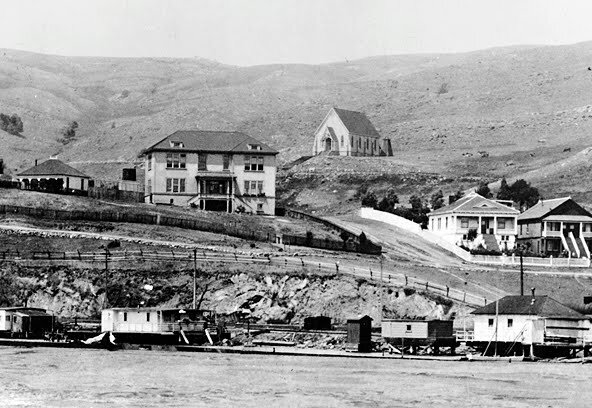 THEN This is the West Point Inn as seen in 1904, the year of its construction. It was built to provide railroad visitors with an overnight stopover and restaurant. This is the westernmost location of the train line. NOW This is West Point Inn today. 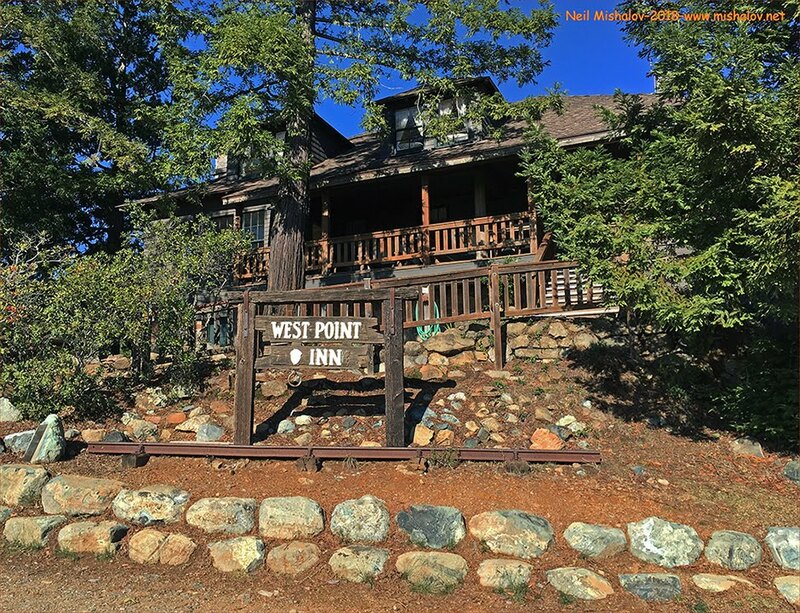 The inn is still operational; there are five detached cabins, a communal kitchen, plus seven guest rooms located on the second floor of this building. There is no electricity, and you need to bring your food and supplies. This is a picture postcard view of the train depot sited just below the east peak summit. The view is looking south. The building on the left is the original Tavern of Tamalpais; it burnt down in 1923. The train tracks run between the Tavern of Tamalpais and the dance hall, which was also consumed by the flames. The building to the right of the dance hall was a government weather station. The steam train and gravity car passenger loading and discharging area is also visible. It appears that a four-car steam train is accepting passengers for the trip down to Mill Valley. This photo is circa 1921. NOW Here is a view of the northernmost section of the steam train and gravity car passenger loading and discharging area. This is a replica of gravity car No.22. The now unused fire lookout station is visible on the summit of the east peak, 2,572 feet (784 meters). THEN Here is the original gravity car No. 22, as seen about 95 years ago. The REO Motor Car Company in Lansing, Michigan, manufactured the automotive vehicle seen in this picture. The REO Motor Company was in business from 1905 to 1975. This particular vehicle was known as an REO Speed Wagon. The Speed Wagon was a light truck which is considered an early version of present-day pickup trucks. This photo is circa 1922. THEN On the right side of the train is the original Tavern of Tamalpais, and on the left is the dance hall. They were both constructed in 1896. The fire lookout station at the summit of the east peak is visible. A steam train is leaving the summit area and traveling back to Mill Valley. 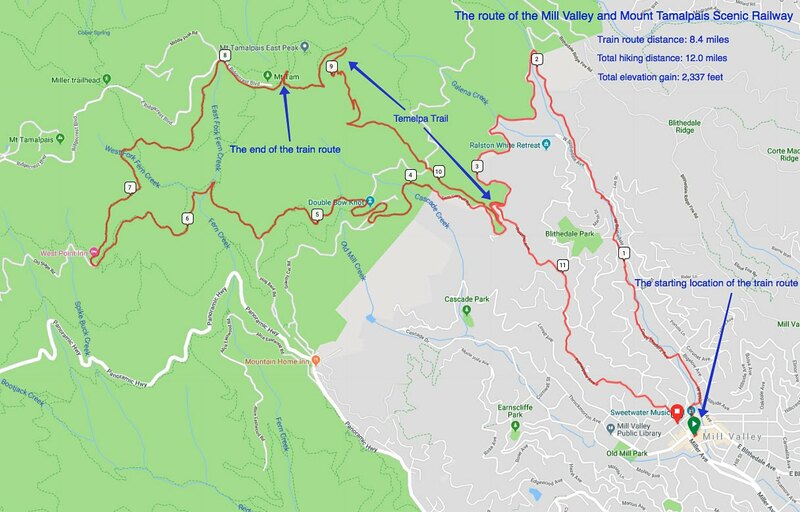 The train will travel approximately 8.2 miles and descend approximately 2,300 feet to reach Mill Valley. This photo is circa 1908. THEN This is a photo of the replacement Tavern of Tamalpais. 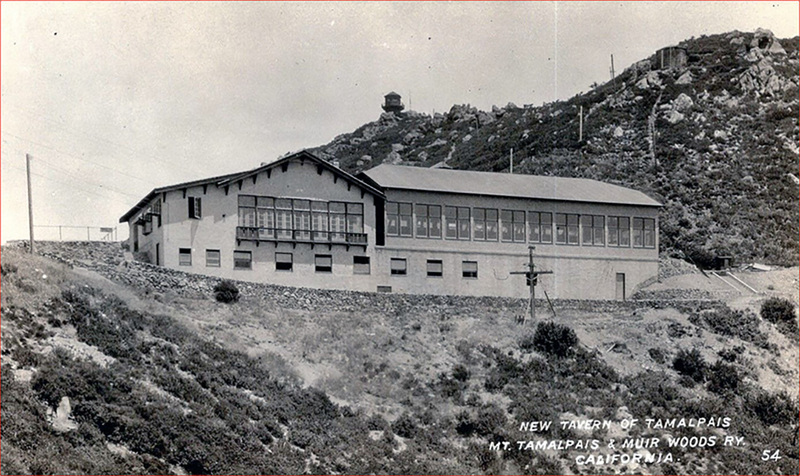 It was constructed in 1924 after the original tavern and the dance hall were both destroyed by a brush fire in 1923. The dance hall was not rebuilt. The fire lookout station at the summit of the east peak can be seen. This photo is circa 1924. This is part of a brochure that was handed to prospective gravity car riders on 22 April 1913. THEN A view of gravity car No. 21 cruising down through Muir Woods. This photo is circa 1910. 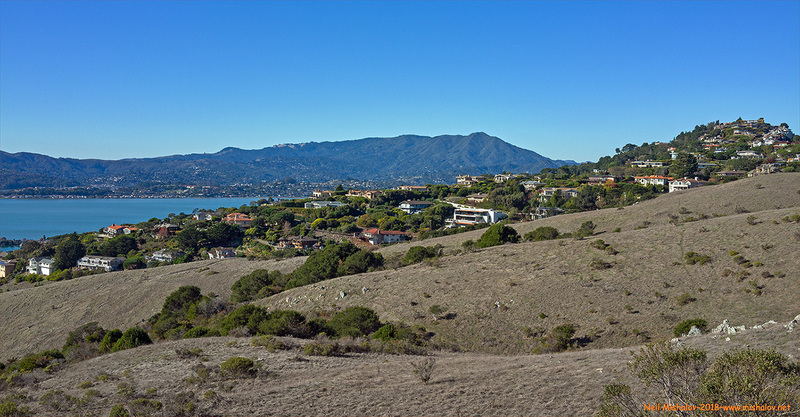 This panoramic photo was taken from the Verna Dunshee Trail. The view is looking south. The entirety of San Francisco can be seen, from the Pacific Ocean to San Francisco Bay. 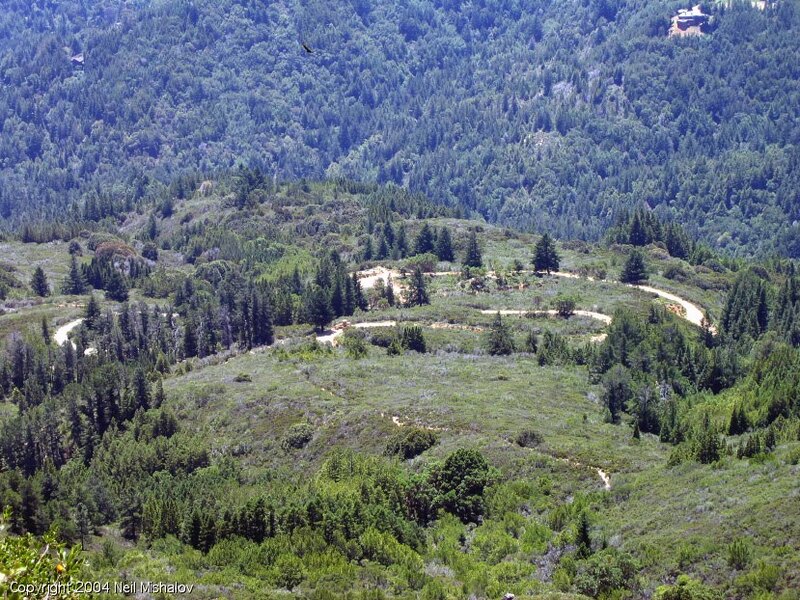 This photo, looking east, was taken from the steep and gnarly Temelpa Trail. Ahead is San Rafael, San Quentin State Prison, and China Camp State Park. This scene from the Verna Dunshee Trail is looking southeast. Mill Valley, San Francisco Bay, Alcatraz Island, the Tiburon Peninsula, Sausalito, and Angel Island are visible. This is a view of the upper portion of the Temelpa Trail as seen from the Verna Dunshee Trail. The scene is looking northeast. 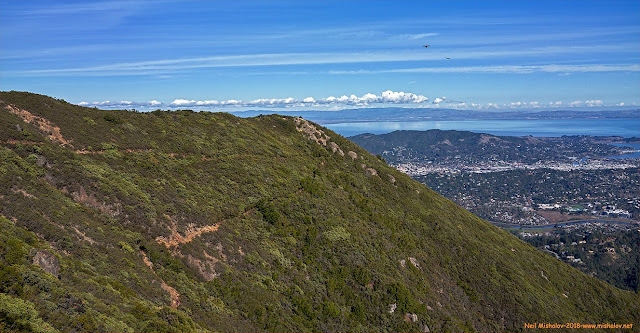 A panorama of Blithedale Ridge, Corte Madera Ridge, Mount Diablo, the Richmond-San Rafael Bridge, San Quentin State Prison and the city of Richmond are amongst the sights identifiable in this photograph taken from the Temelpa Trail. The view is looking east. It has been more than one hundred and twenty years since the Mill Valley and Mount Tamalpais Scenic Railway started operation. It has also been eighty-eight years since the railroad ceased operation. 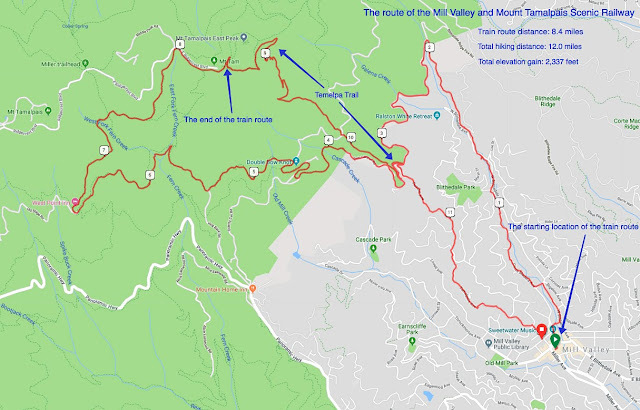 After all that time you would probably think there is nothing new happening in regards to the Mount Tamalpais & Muir Woods Railway. That would be a mistake. The Heisler Locomotive Works, located in Erie Pennsylvania, finished the construction of locomotive car No. 9 in March 1921. 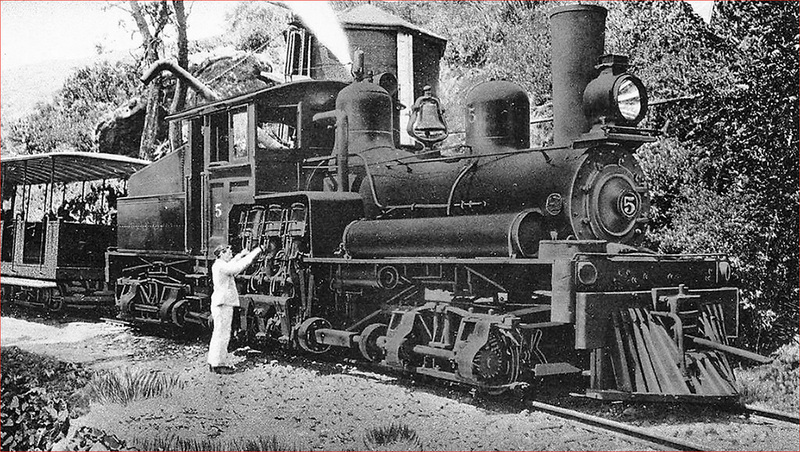 The 72,000-pound locomotive was purchased by, and shipped to, the Mount Tamalpais and Muir Woods Railway in 1921. As automobiles became less expensive and more popular, a vehicular road was constructed from Mill Valley to the east peak of Mount Tamalpais. Cars and roads quickly became the bane of railroads. 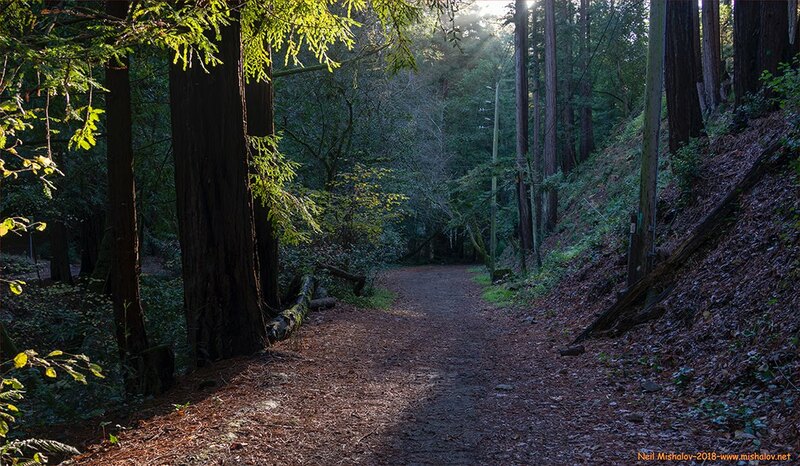 The number of people using the Mount Tamalpais and Muir Woods Railway decreased, and traffic by gasoline-powered motor vehicles to the mountaintop increased. The railroad's revenue was diminishing, and the railroad began to experience cash-flow problems. In 1924, the railroad found it necessary to sell locomotive car No. 9 to the Siskiyou Lumber Company in Macdoel, California. 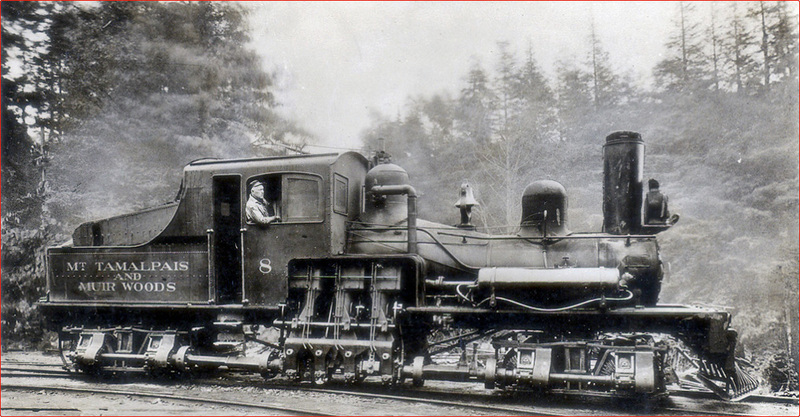 Siskiyou Lumber Company paid $9,750 for locomotive car No. 9. Between 1924 and 1950 Siskiyou Lumber Company leased locomotive car No. 9 to various lumber companies located in northern California. In 1950 Siskiyou Lumber Company sold locomotive car No. 9 to the Pacific Lumber Company, which was located in the town of Scotia, California. When Pacific Lumber ended its steam train operations in 1953, it put locomotive car No. 9 on display outside its headquarters building, where it remained for approximately 68 years. In January 2007 Pacific Lumber Company filed for bankruptcy protection. On 29 July 2008, a judge's order led to the transfer of Pacific Lumber Company's assets, some of which, including locomotive car No. 9, went to the town of Scotia. In early 2018 the Scotia Community Services District put locomotive car No. 9 up for sale in a sealed-bid auction. This is not to say that the Friends of Mount Tam, the Marin History Museum, and the Mill Valley Historical Society had not tried many times over the past 60+ years to purchase locomotive car No. 9. The Pacific Lumber Company always said no to its sale. The auction took place in February 2018. 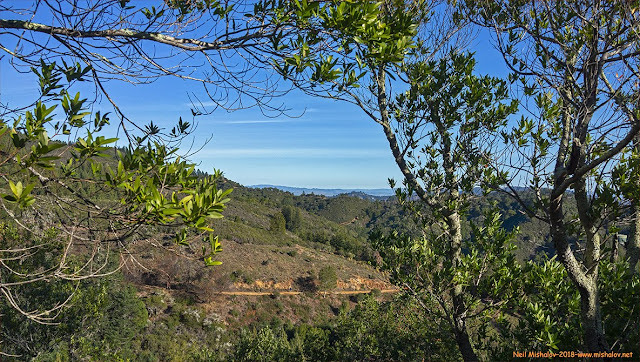 The Friends of Mount Tam, the Marin History Museum, and the Mill Valley Historical Society gathered their resources and placed a bid of $56,240 for locomotive car No. 9. Their offer was the winning bid. Locomotive car No. 9 has since been removed from Scotia and is now at an undisclosed indoor location in the city of Sonoma. I expect that within the next few years locomotive car No. 9 will be on public display in Mill Valley. THEN This photo of Mount Tamalpais and Muir Woods locomotive car No. 9 was taken outside of the Pacific Lumber Company's headquarters building. The car remained at this outdoor location from 1950 thru February 2018. This picture is circa the 1950s. NOW This photo of the Mount Tamalpais and Muir Woods locomotive car No. 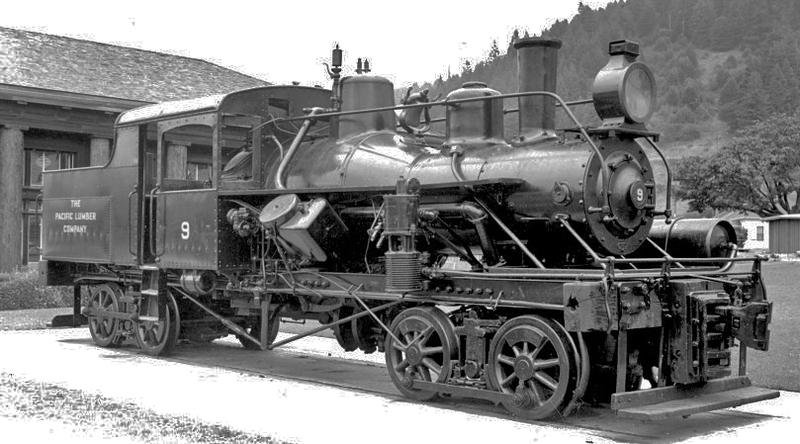 9 was taken at its location at the Pacific Lumber Company site in Scotia, California. This photo is circa 2010. 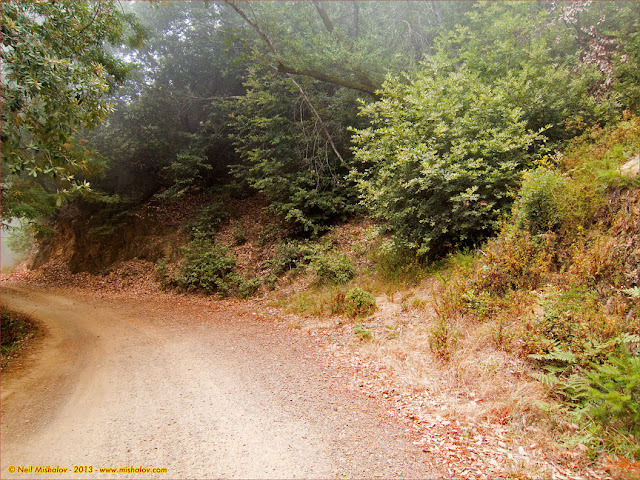 Here is a post about the Mount Tamalpais & Muir Woods Railway that I published on the Internet during July 2013.